Over the past month there have been several high profile and very hotly contested special elections in the United States, including in Georgia’s 6th Congressional District and in South Carolina’s 5th Congressional District. Each one of these races filled a void left by a Trump cabinet appointee and saw record amounts of money being spent. In addition, earlier in June, the British Parliament held a snap Parliamentary election, that could be the sign of more political instability in the UK following last summer’s Brexit vote. We have compiled a breakdown and analysis of each of these races below. Republican Karen Handel defeated Democrat Jon Ossoff to win Georgia’s Sixth Congressional District during the culmination of a hotly contested special election on Tuesday June 20th. Billed as a referendum on President Donald J. Trump, the highly visible race became the most expensive congressional election in United States history, attracting approximately $60 million, according to Issue One, a nonpartisan advocacy group. That money includes funding for the April 18 special election, as well as the June 20 runoff. Outside groups spent more than $27 million on the election, with pro-Handel organizations spending roughly 2.5 times more than pro-Ossoff groups. With 52 percent of the vote, Handel fills a seat vacated by former Rep. Tom Price, who now serves as the Health and Human Services Secretary in the Trump administration. Handel’s win makes her the first Republican congresswoman in Georgia history. Similarly, she was the first Republican Secretary of State elected in Georgia after a victory in 2006. In 2010, she narrowly lost the GOP gubernatorial nomination before becoming the Senior Vice President of Public Policy at the Susan G. Komen Breast Cancer Foundation. However, she resigned in 2012 after the organization reversed a plan to cut ties with Planned Parenthood. After a failed senate bid in 2014, Handel announced her candidacy for the sixth district’s seat in February 2017. 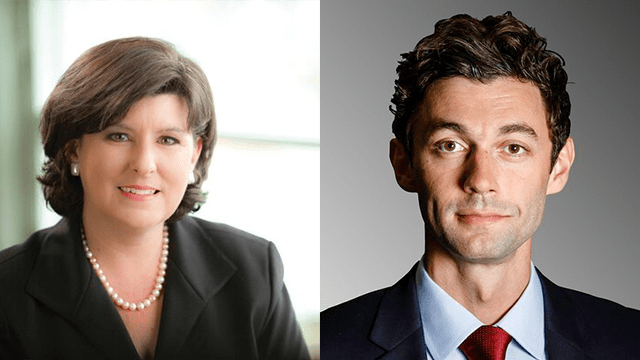 Before Tuesday’s runoff, Handel and Ossoff competed in a special election on April 18. Both failed to grab a majority of the vote. Ossoff, who was one of five Democrats received 48 percent, while Handel was one of eleven Republicans and only garnered 18 percent. Their respective performances set the stage for a heavily funded race that attracted an intense level of national media. With $23.9 million spent on both the special election and the runoff, Ossoff came within 10,000 votes of claiming a reliably Republican district located in the Northern Atlanta suburbs. Former Speaker of the House Newt Gingrich held the seat from 1979 to 1999, while Price consistently won the district with more than 60 percent of the vote since his initial victory in 2004. However, Trump only won the district by two points in November–the same margin of victory for Handel. GOP ads attacking Ossoff hammered the former congressional aide and documentary filmmaker for a lack of experience and living outside the district. The ads also focused on funding he received from west coast donors. Handel will likely face another intense challenge during the 2018 midterm elections. Republican Ralph Norman defeated Democrat Archie Parnell in another special election Tuesday night. Norman fills a seat vacated by current White House Budget Director Mick Mulvaney. While Northam won the reliable conservative district 52 to 48 percent, it pales compared to Mulvaney’s 21-point victory in November. Moreover, Trump won the district by 18 points. Norman has served as a hardline conservative in the state legislature since 2009, and has already promised to join the House Freedom Caucus. Parnell, a former Goldman Sachs and Exxon Mobil employee, saw the Democratic Congressional Campaign Committee pour $300,000 into his race, while the Georgia contest received $5 million. The National Republican Congressional Committee spent less than DCCC in South Carolina, while pouring more than $6.7 million into Handel’s race. On June 8th, 2017, each of the United Kingdom’s 650 Parliamentary constituencies elected new Members of Parliament (MPs) to the British House of Commons. Under the terms of the Fixed-term Parliaments Act of 2011, an election was not scheduled to be called until at May 7th, 2020, however on April 19th, 2017, Prime Miniser Theresa May called for snap elections in the wake of growing discontent. Although Prime Minister May’s Conservative party had been approximately 20 points ahead in the polls of the Labour party, what had occurred was anything but, and resulted in what has been described as one of the most dramatic collapses in British political history. In a surprising result, the Conservatives received a net loss of 13 seats, with 42.4% of the vote, while Labour received a net gain of 30 seats, with a 40.0% of the vote. This was the closest result between the two main parties since February 1974, and the highest percentage of the vote for an opposition party since 1970. Although the Prime Minister May was invited by the Queen to form a Government, it is currently unclear how long she will retain power, given the overwhelming numbers the Labour opposition government has seen. With rising unrest over social issues, international issues, and of course, the backlash over last year’s Brexit vote, Theresa May’s time as prime minister may in fact be short lived.